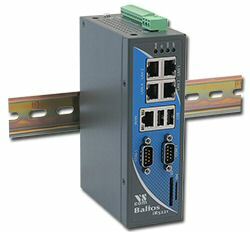 The OnRISC Baltos iR 5221 is a fanless and DIN-Rail mounting suitable industrial embedded PC with compact dimensions. It is based on an ARM Cortex-A8 with NEON SIMD Coprocessor, with up to 1GHz CPU clock speed. Low power consumption (3W typical), an extended temperature range (−20°C to 65°C), a wide power supply (12 — 50V DC) and an impressive MTBF (10.5 Years at 45°C) are qualities that make it an ideal system for industrial automation. Thanks to it's rich connectivity Baltos devices can be used as IoT Gateways connecting sensors/actuators and arbitrary cloud providers like Amazon's AWS IoT, Microsoft's Azure IoT Hub and others using MQTT protocol directly or via the cloud providers own APIs. Besides Baltos series can also serve as a controller. Both roles can be easily programmed using either traditional programming languages or Node-RED*, a visual flow-based programming for the Internet of Things. Baltos embedded systems run several Linux flavored distributions on an ARM core as an operating system. In addition, two pre-packaged bootable SD cards are provided: The Debian GNU/Linux and an upstream OpenWrt image; the latter includes an install-option to the internal flash memory. A VPN router firmware specialized in easy-to-use VPN networking is also available (VPNRouter). Baltos iR 5221 can be booted from either NAND flash or SD card. The NAND flash is a robust boot medium capable of withstanding power cuts and vibrations. SD cards have the advantage of providing arbitrarily large storage amounts. Buildroot, Yocto and OpenWrt BSPs provide a small footprint and would fit well into the NAND storage, whereas Debian is best used on the SD card. The system allows extension with broadband GSM/3G/4G-Modems for installation on mobile internet bases. WLAN802.11b/g/n is available as a common option; furthermore, three locations for SMA-antenna sockets are provided. The great variety of interfaces such as LAN, USB, RS232/422/485 serial ports, I²C, Digital I/O and CAN-Bus enable Baltos iR 5221 to act like a powerful gateway between networks, various industrial devices and field buses. The Baltos series are fully ESD and surge protected, complying with IEC 61000-4-2 (8KV air and 4KV contact). For the Baltos series there is a software option that uses the viaVPN Cloud system (www.viaVPN.com), which can be remotely accessed and monitored over the Internet. viaVPN provides secure and strongly encrypted access, without the need for any reconfiguration of existing firewalls. In case a customer's firmware/application is accessible via Ethernet or Wifi — as for example via a web interface or Telnet/SSH connection — viaVPN extends the access over internet by a protected VPN tunnel. Based on branch DD 'Designated Driver', comes ready-to-use on an SD card. Installation into NAND Flash memory is supported. To self-create this software the setup procedure is on GitHub. The daemon to access the viaVPN system provides secure Remote Access over Internet. It supports a Debian-based Installation, and Buildroot as well. viaVPN provides easy access to remotely installed systems. Software installation is quickly done with convenient tools to get access from everywhere. All communication uses a VPN-tunnel encrypted by SSL/TLS and AES-256. viaVPN Cloud Server access uses common web ports. Reconfiguration of firewalls is not required. This enables the use with mobile networks. on Digital I/O connector: 0.5A @ 5V max.